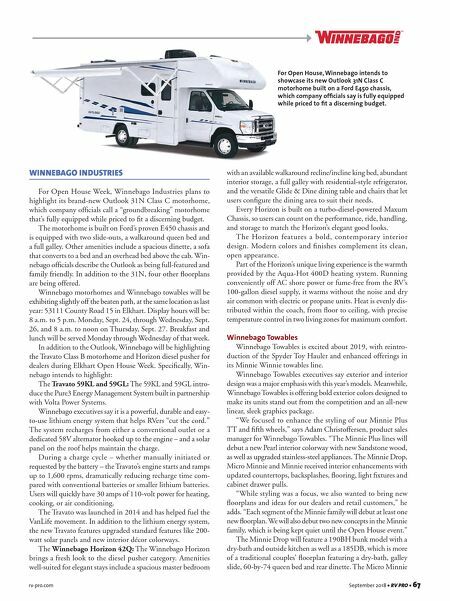 rv-pro.com September 2018 • RV PRO • 67 WINNEBAGO INDUSTRIES For Open House Week, Winnebago Industries plans to highlight its brand-new Outlook 31N Class C motorhome, which company officials call a "groundbreaking" motorhome that's fully equipped while priced to fit a discerning budget. The motorhome is built on Ford's proven E450 chassis and is equipped with two slide-outs, a walkaround queen bed and a full galley. Other amenities include a spacious dinette, a sofa that converts to a bed and an overhead bed above the cab. Win- nebago officials describe the Outlook as being full-featured and family friendly. In addition to the 31N, four other floorplans are being offered. 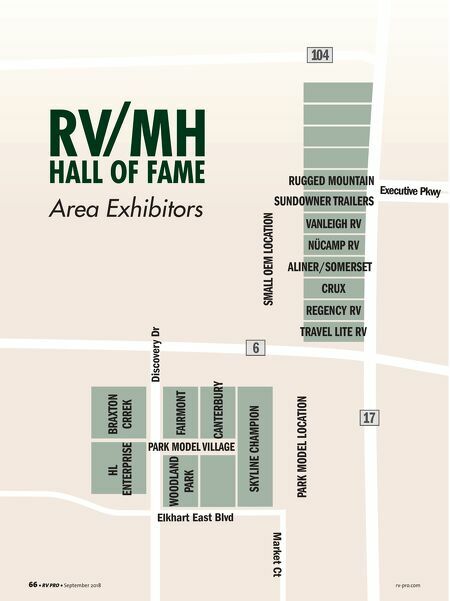 Winnebago motorhomes and Winnebago towables will be exhibiting slightly off the beaten path, at the same location as last year: 53111 County Road 15 in Elkhart. Display hours will be: 8 a.m. to 5 p.m. Monday, Sept. 24, through Wednesday, Sept. 26, and 8 a.m. to noon on Thursday, Sept. 27. Breakfast and lunch will be served Monday through Wednesday of that week. In addition to the Outlook, Winnebago will be highlighting the Travato Class B motorhome and Horizon diesel pusher for dealers during Elkhart Open House Week. Specifically, Win- nebago intends to highlight: The Travato 59KL and 59GL: The 59KL and 59GL intro- duce the Pure3 Energy Management System built in partnership with Volta Power Systems. Winnebago executives say it is a powerful, durable and easy- to-use lithium energy system that helps RVers "cut the cord." The system recharges from either a conventional outlet or a dedicated 58V alternator hooked up to the engine – and a solar panel on the roof helps maintain the charge. During a charge cycle – whether manually initiated or requested by the battery – the Travato's engine starts and ramps up to 1,600 rpms, dramatically reducing recharge time com- pared with conventional batteries or smaller lithium batteries. Users will quickly have 30 amps of 110-volt power for heating, cooking, or air conditioning. The Travato was launched in 2014 and has helped fuel the VanLife movement. In addition to the lithium energy system, the new Travato features upgraded standard features like 200- watt solar panels and new interior décor colorways. The Winnebago Horizon 42Q: The Winnebago Horizon brings a fresh look to the diesel pusher category. Amenities well-suited for elegant stays include a spacious master bedroom with an available walkaround recline/incline king bed, abundant interior storage, a full galley with residential-style refrigerator, and the versatile Glide & Dine dining table and chairs that let users configure the dining area to suit their needs. Every Horizon is built on a turbo-diesel-powered Maxum Chassis, so users can count on the performance, ride, handling, and storage to match the Horizon's elegant good looks. The Horizon features a bold, contemporary interior design. Modern colors and finishes complement its clean, open appearance. Part of the Horizon's unique living experience is the warmth provided by the Aqua-Hot 400D heating system. Running conveniently off AC shore power or fume-free from the RV's 100-gallon diesel supply, it warms without the noise and dry air common with electric or propane units. Heat is evenly dis- tributed within the coach, from floor to ceiling, with precise temperature control in two living zones for maximum comfort. Winnebago Towables Winnebago Towables is excited about 2019, with reintro- duction of the Spyder Toy Hauler and enhanced offerings in its Minnie Winnie towables line. Winnebago Towables executives say exterior and interior design was a major emphasis with this year's models. Meanwhile, Winnebago Towables is offering bold exterior colors designed to make its units stand out from the competition and an all-new linear, sleek graphics package. "We focused to enhance the styling of our Minnie Plus TT and fifth wheels," says Adam Christoffersen, product sales manager for Winnebago Towables. "The Minnie Plus lines will debut a new Pearl interior colorway with new Sandstone wood, as well as upgraded stainless-steel appliances. The Minnie Drop, Micro Minnie and Minnie received interior enhancements with updated countertops, backsplashes, flooring, light fixtures and cabinet drawer pulls. "While styling was a focus, we also wanted to bring new floorplans and ideas for our dealers and retail customers," he adds. "Each segment of the Minnie family will debut at least one new floorplan. We will also debut two new concepts in the Minnie family, which is being kept quiet until the Open House event." The Minnie Drop will feature a 190BH bunk model with a dry-bath and outside kitchen as well as a 185DB, which is more of a traditional couples' floorplan featuring a dry-bath, galley slide, 60-by-74 queen bed and rear dinette. The Micro Minnie For Open House, Winnebago intends to showcase its new Outlook 31N Class C motorhome built on a Ford E450 chassis, which company officials say is fully equipped while priced to fit a discerning budget.